Simula na naman ng Simbang Gabi para sa Kapsakohan dito sa Pilipinas ngayong December 16 - 24, 2015 - Christmas 2015. Have a merry merry Christmas and a Prosperous New Year sa lahat. 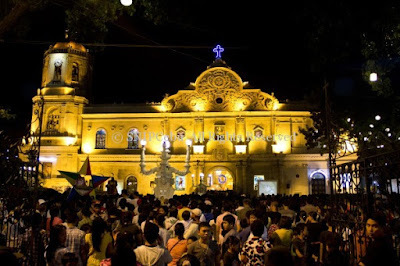 Simbang Gabi (Filipino for "Night Mass") is a devotional nine-day series of Masses practised by Roman Catholics and Aglipayans in the Philippines in anticipation of Christmas and to honour the Blessed Virgin Mary. The masses are held daily from December 16 to December 24, and occur at different times ranging from as early as 03:00 to 05:00 PST. On the last day of the Simbang Gabi, which is Christmas Eve, the service is instead called Misa de Gallo (Spanish for "Rooster's Mass"). The Simbáng Gabi originated in the early days of Spanish rule over the Philippines as a practical compromise for farmers, who began work before sunrise to avoid the noonday heat out in the fields. Priests began to say Mass in the early mornings instead of the evening novenas more common in the rest of the Hispanic world. This cherished Christmas custom eventually became a distinct feature of Philippine culture and became a symbol of sharing.